AC Horn Manufacturing is known for providing solutions to the packaging industry. 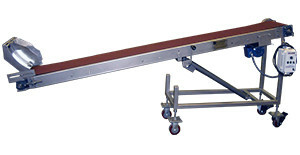 The Packoff Conveyor is another of our packaging solutions. Designed with the operator in mind, all of these systems are fully adjustable for operator comfort, thus minimizing labor requirements normally associated with case packing. Our Packoff Conveyor accepts the bags from the packaging machine, gently conveying them to the Rotary Table for packing.